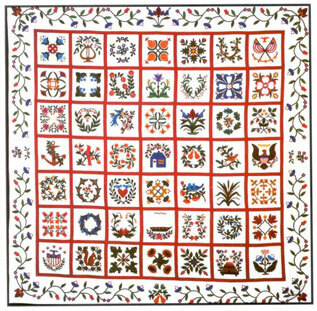 The Folk Fantasy quilt was a fundraiser for the Baltimore Applique Society. The name of the lucky winner of this quilt was drawn at the Quilts and Cuisine of Baltimore Symposium and Quilt Exhibit presented by the Baltimore Applique Society in October 1996 at the Baltimore International Culinary College. The blocks and color scheme for Folk Fantasy were designed by Jeana Kimball, a nationally known teacher, lecturer, and author. (Jeana is also a Professional Advisor for the Baltimore Applique Society.) The 90x90-inch quilt was stitched in 1995 by more than 65 BAS members. Then, Elisabeth Kershaw and Eleanor Eckman designed and coordinated the border construction. Wanda Strader quilted Folk Fantasy. The 8-inch block patterns can be found in the book Natures Chorus, A Celebration in Applique by Jeana Kimball, ©1996. In December 2013, BAS received Folk Fantasy from Susan Hinzman who had received this quilt in the 1996 raffle and willed it to us. We honor and thank her for it and remember our history.